CNN Marketplace Middle East promotes Mr Usta's success story and entrepreneur ecosystem of Dubai and the UAE. Mr Usta is one of the best startups in Dubai creating business leads for SMEs and finding best services to UAE residents. Most, if not all successful businesses, start with an idea to find a solution to a problem. In this interview, Spencer Lodge finds that's exactly the case with Ibrahim Colak, former Engineer turned award-winning entrepreneur, and his award-winning startup, Mr Usta! Once again Spencer sits down to chat with another Entrepreneurial Bada$$. This time he talks with Ibrahim Colak, nominated as one of the top 100 entrepreneurs in the UAE, nominated as Arabian Business startup of the year ( Mr Usta) AND Entrepreneur of the year, one of Forbes top 100 startups in the Middle East, and winner of the Admin App of the year award....whew, I'm tired from typing all of those accolades! Trailblazing start-up Mr Usta has streamlined how service providers (Ustas) and customers connect in the UAE. The online marketplace has allowed service providers to promote their businesses online. Customers can also post job requests (plumbing, carpentry, AC repair, etc.) and connect directly with businesses that provide the service. At the heart of Mr Usta’s platform is the desire to use the latest cloud technology for market-leading results. Standing on stage at an event in Abu Dhabi to celebrate International Women 's Day, Dunia Othman was quizzed by members of the mainly female audience on why, out of all of the opportunities open to her, she chose to male-focused name for her product and even put a prominent moustache in her logo. Over the course of the past four years, Ibrahim Colak and Dunia Othman have changed the face of home services with their company Mr Usta. Founded by the duo after a frustrating experience with a faulty air conditioning unit, Mr Usta is a platform for finding home service providers. Helping customers find the right people for their various jobs, and giving providers a means of pitching for particular work, the website features around 6,000 tradespeople across 250 categories, with jobs totaling a reported Dhs30m ($8.2m) happening through the portal per year – growing at 20 per cent per month. Yet another best in class app which helps you to find the best maid services in the city of gold: Dubai. You will be able to find the best services through this app as it is the class service provider platform. Be it any kind of services such as the painting of your home or related to cooking new recipe of your choice, planning for your birthday party or any other service you require like the fixing of your car when it breaks down. You can get the best services you need in whole UAE. The main categories of this app includes home services like cleaning of house, plumbing, handyman, carpentry services, auto services, building and construction oriented services and many more like the moving services, entertainment services such as the wedding, photography, business services, etc. العالم يفسحُ الطريقَ للمرءِ الذي يُعرفُ إلى أين هو ذاهب، هكذا وصفَ الفلاسفة الإنسان الذي يرفضُ الاستسلامَ للفشل، ويصرُ على النجاح، اليوم نرى شباباً عاطلاً ينتظرُ الوظيفة..ونساءً يائسات يشكينَ الفراغ .. ووسطَ هؤلاء تظهرُ ثُلة من الشباب اقتحموا بيئةَ الجمود ليطلقوا مشاريعَ خاصة بهم وسطَ توفرِ الفرصِ الجيدة لبيئةٍ حرة مرنة..بالرغمِ من التحديات التي تقفُ أمامهم بدءا من الحصولِ على فكرةِ مشروعٍ صغير ومربح مرورا إلى التخطيطِ و التنفيذ ، وصولا إلى تحقيقِ النتائج المنشودة. خدمات أحسن لحياة أفضل ... هو شعار شركة مستر أسطه MrUsta المتخصصة في تقديم أسرع و أفضل الخدمات المنزلية بأقل التكلفة و أقل الوقت لجعل الحياة أسهل و أسعد. Mr Usta Saves the Day! Oh, dear mums, I don’t even know where to start when it comes to house maintenance. With many husbands working long hours or extensively travelling, most of the times things like AC cleaning/sanitizing, wall painting, pipes changing or repairing, home appliances repairing and such become our responsibilities, we have to find the best company, the best price and the best time to schedule the service. So, what do we do? We turn to word-of-mouth recommendations and internet and we launch in a time consuming search for a company that would be ideal for us in terms of quality and money. I always say that when you need to know something just ask Google. But…surprise, surprise! Here, in Dubai, there is Mr Usta! Mr Usta fulfills a widespread, critical need of most UAE residents: quality home services. Instead of having to pay unqualified service people for poor quality work, the startup allows users to search through a range of service providers, read reviews, and compare prices to select the best professional for the job. Set up in 2014, Mr Usta is an online portal connecting UAE residents with service providers such as plumbers, painters, cleaners etc. Customer growth since launch has been over 500%, they claim. In October 2016, it raised $750,000 in a pre-series A round. All of the companies in our infographic are based in the Emirate of Dubai. Collectively, these companies have raised approximately $2.3B. Dubai TV Money Map show promoted Mr Usta on 24.10.2015. Watch this video to learn more about Mr Usta concept, founders and future plans. The Entrepreneur of the Month Dunia Othman from Mr Usta. She shares some insight on the evolving world of smart outsourcing and how new startups are changing the way we shop for service providers. Our Industry Insider this week is Ibrahim Colak - the Co-Founder and CEO of Mr Usta. He joins us and share what Mr Usta means and how it started. 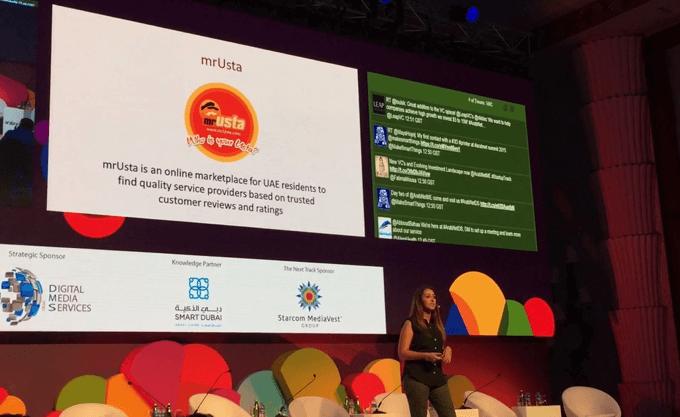 Mr Usta, an online services marketplace launched in Dubai by Ibrahim Colak and Dunia Othman, has successfully closed a AED 2.75 million pre-series A funding round.
" Mr Usta, rests on a win-win model for all stakeholders involved - small service providers struggling to reach more customers coupled with UAE residents in desperate need of their services. Following the closure of their seed fundraising round in September 2015, the Mr Usta team was able to release a new version of the website with new iOS and Android applications, which were downloaded more than 2,500 times in the first two months. The platform lists a few thousand home service providers – described by the co-founders as ‘Ustas’ – in various categories, with each profile containing not only the contact information and location, but also the reviews and ratings posted by previous customers." "A Dubai-based online marketplace that connects service providers with clients in need has raised AED 1.3 million ($353,934) in seed financing." "Together with her husband and two partners, Dunia Othman, co-founder and chief marketing officer at Mr Usta, has developed an online business directory of local service providers which also offers a service rating system accessible through mobile devices and PCs." "It may not have been top of the business plan, but Ibrahim Colak can now cite rescuing a drone from a tree as a service offered via his online marketplace. The company is part of a wave of online platforms linking professional services, such as plumbers, electricians – and men with ladders –to residents seeking reliable home service providers." "In October 2013, Dunia Othman and Ibrahim Colak cut short their honeymoon in Crete to pitch their idea for a technology start-up to Afkar, a digital business incubator. Their idea was to launch a new online marketplace to link tradespeople – from painters to martial arts instructors – with UAE residents." "It’s not too hard to see what makes Mr Usta so appealing to its 350-odd client base. Let’s put it this way: if you’ve ever had to frantically search your contact list or ask friends for recommendations of a maintenance company after one of the pipes in your apartment bursts, Mr Usta can come to the rescue." " More than ever, quality in the service industry is essential, and the UAE-based Mr Usta , an online marketplace for consumers to find and book service providers founded in 2013, has strived to accomplish this- and now, investors have taken notice.."
"أعلنت شركة “مستر أسطه” Mr.Usta عن حصولها على 2.75 مليون درهم إماراتي، من كلِ من “بريسينت بارتنرز” Precinct Partners، و”ميلينيال بارتنرز أند كو”Millennial Partners & Co، إلى جانب مستثمرين أفراد من السعودية ومصر، لم يتم الكشف عن هويتهم." Mr Usta was born out of a desire to provide everyone with an easy way to find quality trades people on the basis of customer feedback. Seems like a simple one, this is the one you need because you never know when it will come in handy! Founder - Ibrahim Colak"
"A smart UAE will depend on how today’s new businesses integrate technology into their operations. GN Focus profiles a few national and expatriate innovators and examines how they’ve gotten off the ground"
An entrepreneur with a mix of marketing, business management and engineering experience, Othman is the mother of a five-month-old baby and has had a tough time working as a young software engineer abroad due to her gender. Today, although she is a co-founder of her company, she said she still has to constantly prove herself." From plumbers to cake decorators, can Mr Usta provide the quick fix for Dubai's expats? "While sitting at the Business Development table during Mix N’ Mentor Dubai, two entrepreneurs caught my attention: Ibrahim Colak and his wife Dunia Othman, the cofounders of Mr Usta, an online marketplace in UAE that links residents with different service providers." "When Ibrahim Colak, founder of UAE service providers platform Mr Usta, attended a networking event at Dubai’s In5 innovation center, he didn’t expect it to lead to a seed investment of $351,000." "Ibrahim Colak, founder of MrUsta, joined In5 in January. He said the incubator took care of many difficult details for him, leaving the firm to focus on growth and innovation. “It’s not easy to be an entrepreneur in Dubai. There are renting costs and other costs, and you need networks to reach the right people,” Colak said." "Mr Usta provides an Internet directory of service providers in the United Arab Emirates. The company’s platform incorporates a search engine which enables potential customers to search for service providers based on name, location, or category, as well as allows past customers to rate or comment on service providers they have used. The company is headquartered in Dubai"
"You’ve no doubt heard horror stories from mates in the UAE about dodgy removal firms and crooked maintenance staff (our favourite is the Style staffer who went home early one day to find his maid wearing his Lacoste polo shirt). MrUsta takes this game of chance out of the equation: service providers in your area are recommended on the app by fellow users." "Finding quality service providers can be like trying to resolve an issue with your electricity bill. Everyone wants you to pay up and no one wants to hear about your problem . When many of us need a service, we usually head straight to sites like Dubizzle and end up spending hours scrolling through page after page of identical ads.Mr Usta is a UAE based online marketplace that simplifies the process. It uses customer ranked data to help people find services ranging from painters to cake decorators, for free (and in case you’re wondering, “usta” means master, guru, or expert in Turkish. It is also used in Iraq and the Gulf in old Arabic!)"